DELAFIELD, Wis. (Stockpickr) -- Trading stocks that trigger major breakouts can lead to massive profits. Once a stock trends to a new high or takes out a prior overhead resistance point, then it's free to find new buyers and momentum players who can ultimately push the stock significantly higher. Breakout candidates are something that I tweet about on a daily basis. I frequently tweet out high-probability setups, breakout plays and stocks that are acting technically bullish. These are the stocks that often go on to make monster moves to the upside. What's great about breakout trading is that you focus on trend, price and volume. You don't have to concern yourself with anything else. The charts do all the talking. Trading breakouts is not a new game on Wall Street. This strategy has been mastered by legendary traders such as William O'Neal, Stan Weinstein and Nicolas Darvas. These pros know that once a stock starts to break out above past resistance levels and hold above those breakout prices, then it can easily trend significantly higher. With that in mind, here's a look at five stocks that are setting up to break out and possibly trade higher from current levels. One communications equipment player that's starting to spike within range of triggering a big breakout trade is Allot Communications (ALLT - Get Report), which develops, markets, and sells intelligent Internet protocol service optimization, monetization and personalization solutions worldwide. This stock has been hammered lower by the bears over the last six months, with shares down sharply by 42.1%. If you take a look at the chart for Allot Communications, you'll notice that this stock recently gapped down sharply from over $7 a share to right around $5.50 a share with heavy downside volume flows. That move came after a massive downtrend for shares of Allot Communications, which took the stock lower from its March high of $9.51 a share to its July low of $5.18 a share. This stock went on to print a new 52-week low on Thursday at $5, but shares of Allot Communications have now started to rebound sharply off that level with strong upside volume flows. That rebound is now pushing this stock within range of triggering a big breakout trade above some near-term overhead resistance levels. Traders should now look for long-biased trades in Allot Communications if it manages to break out above some key near-term overhead resistance levels at its 20-day moving average of $5.37 and then above more resistance levels at $5.59 to $5.68 a share with high volume. Look for a sustained move or close above those levels with volume that registers near or above its three-month average action of 141,575 shares. If that breakout gets underway soon, then this stock will set up to re-test or possibly take out its next major overhead resistance levels at around $6 to its gap-down-day high of $6.08 a share. Any high-volume move above $6.08 will then give this stock a chance to re-fill some of that previous gap-down-day zone from July that started just above $7 a share. Traders can look to buy Allot Communications off weakness to anticipate that breakout and simply use a stop that sits right around its new 52-week low of $5 a share. One can also buy this stock off strength once it starts to clear those breakout levels with volume and then simply use a stop that sits a comfortable percentage from your entry point. 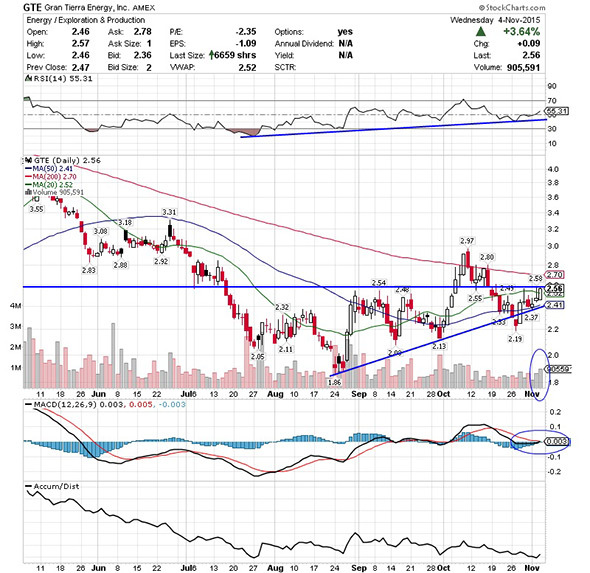 A independent energy player that's starting to trend within range of triggering a big breakout trade is Gran Tierra Energy (GTE - Get Report), which engages in the acquisition, exploration, development, and production of oil and gas properties in Colombia, Peru, and Brazil. This stock has been smacked lower by the sellers over the last six months, with shares down large by 41.8%. If you take a glance at the chart for Gran Tierra Energy, you'll notice that this stock has been downtrending badly for the last three months and change, with shares plunging sharply lower from its high of $3.99 to its new 52-week low of $2.05 a share. During that downtrend, shares of Gran Tierra Energy have been making mostly lower highs and lower lows, which is bearish technical price action. That said, this stock has now started to rebound a bit off that $2.05 low and it's starting to trend within range of triggering a big breakout trade above some key near-term overhead resistance levels. Traders should now look for long-biased trades in Gran Tierra Energy if it manages to break out above some near-term overhead resistance levels at $2.29 to its 20-day moving average of $2.32 and then above more resistance at $2.40 a share with high volume. Look for a sustained move or close above those levels with volume that hits near or above its three-month average action of 1.13 million shares. If that breakout kicks off soon, then this stock will set up to re-test or possibly take out its next major overhead resistance levels at its 50-day moving average of $2.70 to around $2.80, or even $3 a share. Traders can look to buy Gran Tierra Energy off weakness to anticipate that breakout and simply use a stop that sits right around its 52-week low of $2.05 share. One could also buy this stock off strength once it starts to take out those breakout levels with volume and then simply use a stop that sits a comfortable percentage from your entry point. 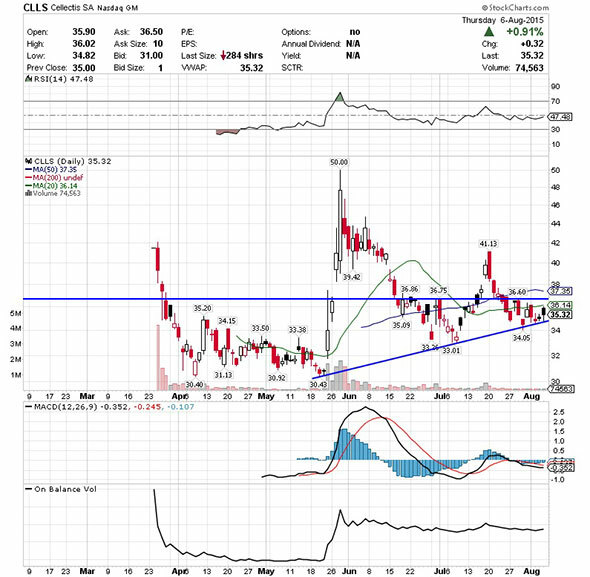 Another stock that's starting to trend within range of triggering a near-term breakout trade is Cellectis (CLLS - Get Report), which develops immuno-oncology products based on gene-edited T-cells that express chimeric antigen receptors for the treatment of cancers. This stock has been on the move to the upside over the last three months, with shares higher by 13.5%. If you take a glance at the chart for Cellectis, you'll notice that this stock has been making higher lows over the last two months and change, which has now formed a strong uptrend line of support following its May low of $30.43 a share. Shares of Cellectis have now started to bounce modestly above some near-term support at $34.05 a share and that move is starting to push this stock within range of triggering a near-term breakout trade above some key overhead resistance levels. Traders should now look for long-biased trades in Cellectis if it manages to break out above some near-term overhead resistance levels at its 20-day moving average of $36.14 to $36.60 and then above its 50-day moving average of $37.35 a share with high volume. Look for a sustained move or close above those levels with volume that registers near or above its three-month average action of 263,175 shares. If that breakout develops soon, then this stock will set up to re-test or possibly take out its next major overhead resistance levels at $41.13 to around $44 a share. Traders can look to buy Cellectis off weakness to anticipate that breakout and simply use a stop that sits right around some key near-term support levels at $34.05 to $33.01 a share. One can also buy this stock off strength once it starts to bust above those breakout levels with volume and then simply use a stop that sits a comfortable percentage from your entry point. A specialty chemicals player that's starting to spike within range of triggering a near-term breakout trade is Methanex (MEOH - Get Report), which produces and supplies methanol in the Asia Pacific, North America, Europe and South America. This stock has been under pressure by the sellers over the last six months, with shares off by 20.9%. If you take a glance at the chart for Methanex, you'll see that this stock has been downtrending badly over the last three months, with shares falling sharply lower from its May high of $61.09 to its recent low of $43.44 a share. During that downtrend, shares of Methanex have been making mostly lower highs and lower lows, which is bearish technical price action. 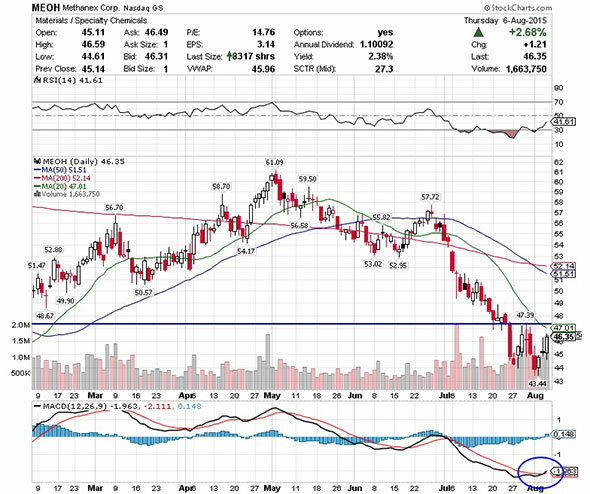 That said, this stock has now started to rip higher off that $43.44 low with strong upside volume flows. Volume on Thursday registered over 1.66 million shares, which is well above its three-month average action of 727,372 a shares. That high-volume spike higher on Thursday is now quickly pushing shares of Methanex within range of triggering a near-term breakout trade above some key overhead resistance levels. Traders should now look for long-biased trades in Methanex if it manages to break out above some near-term overhead resistance levels at its 20-day moving average of $47.01 to $47.39 and then above more resistance at around $48 a share with high volume. Look for a sustained move or close above those levels with volume that hits near or above its three-month average action of 727,372 shares. If that breakout develops soon, then this stock will set up to re-test or possibly take out its next major overhead resistance levels at its 50-day moving average of $51.51 to its 200-day moving average of $52.14 a share, or even $53 to $54 a share. Traders can look to buy Methanex off weakness to anticipate that breakout and simply use a stop that sits right around its recent low of $43.44 a share. One can also buy this stock off strength once it starts to break above those breakout levels with volume and then simply use a stop that sits a comfortable percentage from your entry point. 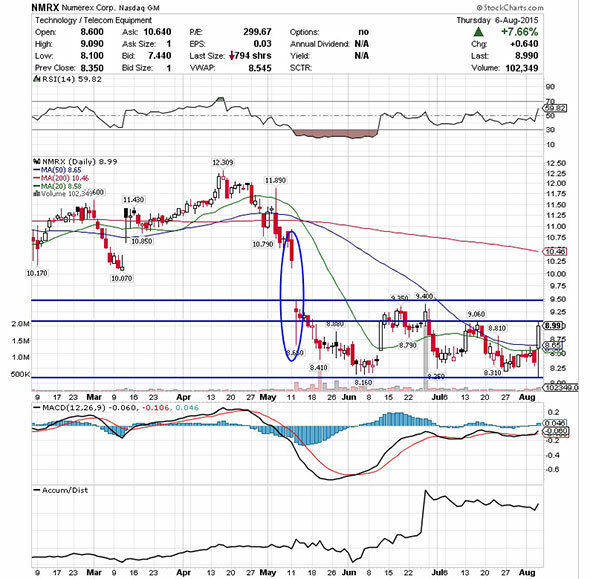 My final breakout trading prospect is technology player Numerex (NMRX, which provides interactive and on-demand machine-to-machine enterprise solutions for the enterprise and government markets worldwide. This stock has been hit notably by the sellers over the last six months, with shares off by 15.8%. If you look at the chart for Numerex, you'll notice that this stock ripped sharply higher on Thursday off its new 52-week low of $8.10 a share and back above both its 20-day moving average of $8.58 and its 50-day moving average of $8.65 a share with decent upside volume flows. This strong move to the upside also pushed shares of Numerex into breakout territory, since the stock cleared or flirted with some key near-term overhead resistance levels at $8.81 to $9.06 a share. This move is now quickly pushing shares of Numerex within range of triggering what could be a much bigger breakout trade. Traders should now look for long-biased trades in Numerex if it manages to take out Thursday's intraday high of $9.09 to more resistance at $9.40 and then above its gap-down-day high from May near $9.50 a share with high volume. Look for a sustained move or close above those levels with volume that hits near or above its three-month average action 106,325 shares. If that breakout materializes soon, then this stock will set up to re-fill some of its previous gap-down-day zone from May that started near $11 a share. Traders can look to buy Numerex off weakness to anticipate that breakout and simply use a stop that sits near its new 52-week low of $8.10 a share. One can also buy this stock off strength once it starts to take out those breakout levels with volume and then simply use a stop that sits a conformable percentage from your entry point.